Home > ADRL > AlAnabi Racing > News > NHRA > Qatar Racing Club > HOW A NITRO FUNNY CAR WORKS - NHRA ANNOUNCER ALAN REINHART! A Nitro Funny Cars can make over 10,000hp and accelerate from 0-100mph in less than 1second;0-300mph in less than 4 seconds! With so much power in it, how does it work? 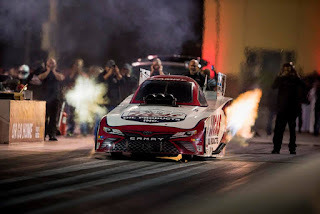 Del Worsham Nitro Funny Car in Qatar! We caught up with Del Worsham Nitro Funny Car in Qatar; The First Nitro Car To Race In Qatar! NHRA Announcer Alan Reinhart takes around what makes it tick!